Prosecutors suggest the operative, already in great legal peril, may have violated a gag order. Roger Stone’s inability to shut up may land him in prison before he even faces trial. Despite finding himself in hot water due to an Instagram post just a few weeks ago, over the weekend he posted on the same platform an image that suggested he was “framed”—a move that may violate a recent gag order. The longtime Trump adviser narrowly escaped imprisonment last month after he posted an image of the federal judge overseeing the case against him that included what appeared to be a crosshairs by her head. At a hearing focused on that Instagram post in late February, US District Judge Amy Berman Jackson left Stone free on bail but amended the terms of release so that he can be jailed if he violates her order barring him from commenting publicly on the case against him. Special counsel Robert Mueller charged Stone with perjury, obstruction of justice, and witness tampering on January 24. Still, on Sunday, Stone suggested he had been falsely charged with crimes, referencing the 1988 movie Who Framed Roger Rabbit. Stone deleted the image after an inquiry about it by CNBC, which first flagged the social-media post on Sunday. Even though he deleted it, the damage of the Instagram post may already be done. On Monday, prosecutors cited Stone’s post in a court motion. 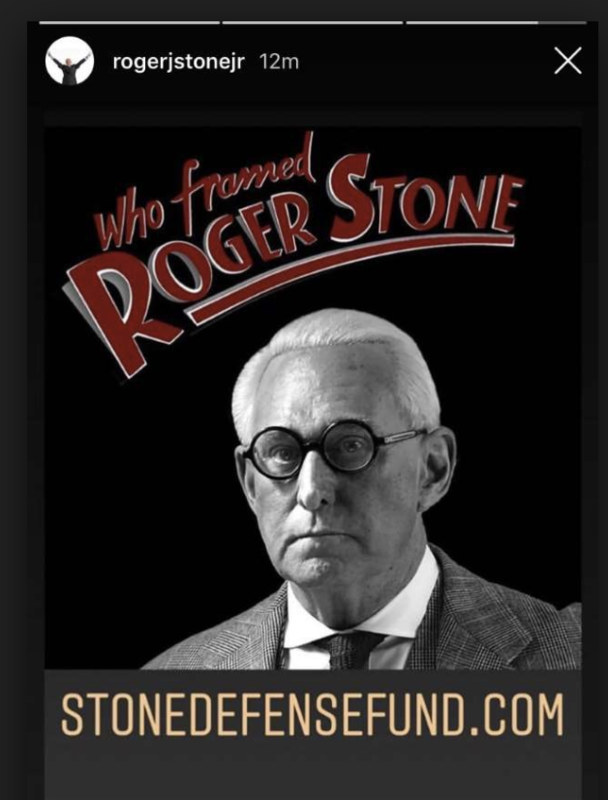 “We note for the Court that according to public reporting, on March 3, 2019, the defendant’s Instagram account shared an image with the title ‘who framed Roger Stone,'” they wrote. They did not include an argument on whether Stone had violated the gag order, but they seemed to suggest as much by flagging the post. Prosecutors’ Monday filing also included information about a book by Stone, which may violate the intent of Jackson’s gag order as well. On Friday, Jackson ordered Stone’s lawyers to explain why their client’s plans to publish the book “was not brought to the Court’s attention” in an earlier court filing or during the February 21 hearing. In a motion also filed Monday, Stone’s lawyers said the book, published online on February 19, was written prior to Jackson’s gag order. But the lawyers did not directly answer Jackson’s query of why they failed to mention the book. Jackson can now decide if Stone has violated the gag order. If she rules he did, he will be in violation of his bail conditions and imprisoned.